Avascular Necrosis (AVN), sometimes referred to as osteonecrosis or ischemic necrosis, may occur as the result of several conditions or incidents, trauma being the most common. However, excessive corticosteroid use (cortisone) is also a high-risk factor that can lead to steroid-induced avascular necrosis. 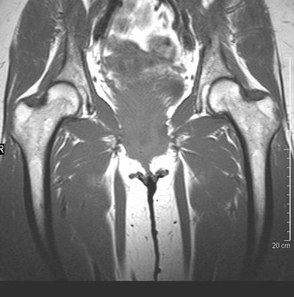 Unfortunately, when associated with excessive cortisone (steroid) use, AVN often is bilateral (occurring in both hips). It may also present in the hip AND knee as well, complicating both assessment and treatment. Avascular Necrosis (AVN) occurs when the blood supply to the bone is disrupted – resulting in ischemia which, eventually, leads to bone cell death. This can lead to rapid joint destruction and bone collapse. Traditionally, treatment for steroid-induced avascular necrosis involved nothing less than surgery. Often, the option presented to the patient was total joint replacement. The problem often associated with steroid induced AVN was it can occur earlier in life and hip or joint replacement at a young age is difficult, as there is the unknown factor of how long the joint replacement will last, and can it be revised during the patients lifespan. Translation: will it it work, as if not the alternate option is/was hip fusion. Obviously a problem for a younger patient. This has lead many patients to consult Dennis M. Lox, MD, for evaluation. 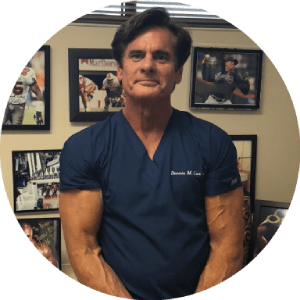 Dr. Lox, a Sports and Regenerative Medicine Specialist, has seen and been consulted worldwide by patients and other physicians seeking advice on regenerative medicine techniques such as Platelet Rich Plasma (PRP) and Stem Cell Therapy. Early assessment and treatment is essential affirms Dr. Lox. However, it is possible to cause new blood flow to the ischemic area and lead to regeneration with stem cell therapy. It may be possible to regenerate the area of necrosis or bone death in these cases Dr. Lox contends as he has treated patients suffering from steroid-induced avascular necrosis (AVN) successfully with PRP and Stem Cell Therapy with avascular necrosis (AVN). The future of medicine is regenerative treatments. Stem cell therapy and PRP are potential viable alternative options to patients to turn to rather than just wait and see if their joint collapses and erodes leading to hip or other joint replacement.